CORRELATION 8: An unprecedented Bond Market Rout. 5. Absent an increase in overall market volume, liquidity will collapse to even more unprecedented depths as the volume/volatility ratio hits new all time lows. 7. 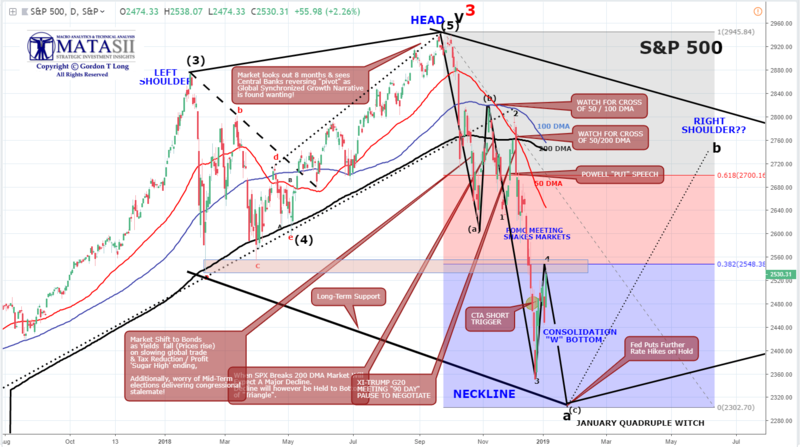 Consequentially we will see a "Right Shoulder" market formation in the first half of 2019. 8. The Market is likely to put in a "W" bottom before beginning building the "Right Shoulder" market formation. We laid out our expectations for a Wave 4 lift when we hit our Wave 3 Target. Few believed this was in the works - never mind the "W" bottom and a potential Right Shoulder in first half 2019 based on A fed capitulation. 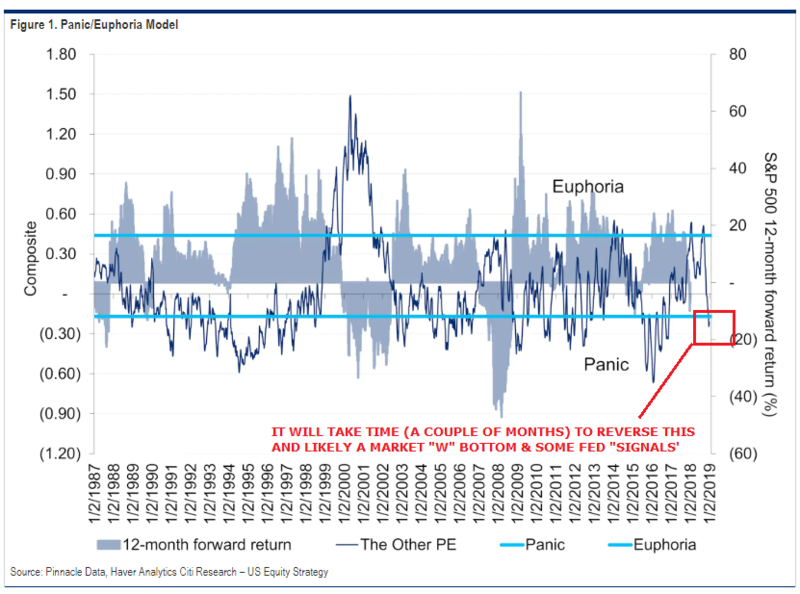 Our assessment is that it will take a couple of months PLUS some Federal Reserve "signals" on reversing or moderating its current monetary policy direction to reverse the Panic/Euphoria Sentiment Model. We therefore expect the above "W" bottom to be required. The Long Term Trend Line for the S&P 500 going back to the Dotcom Bubble Highs suggest the market may be near an initial support level. 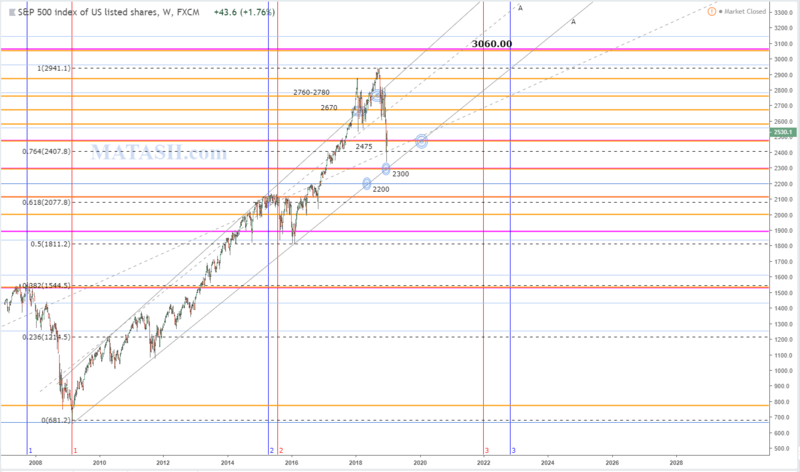 The chart is based on a log scale for dramatic price movement during this 19 year period. Institutional Investors are prone to use Regression-to-the-Mean Analysis. Shown in red below is the Regression for this period of time. Price is now at the point of Regression. It is interesting to note that the Trend Channel for this period (shown in blue) shows price to be near the upper channel boundary. 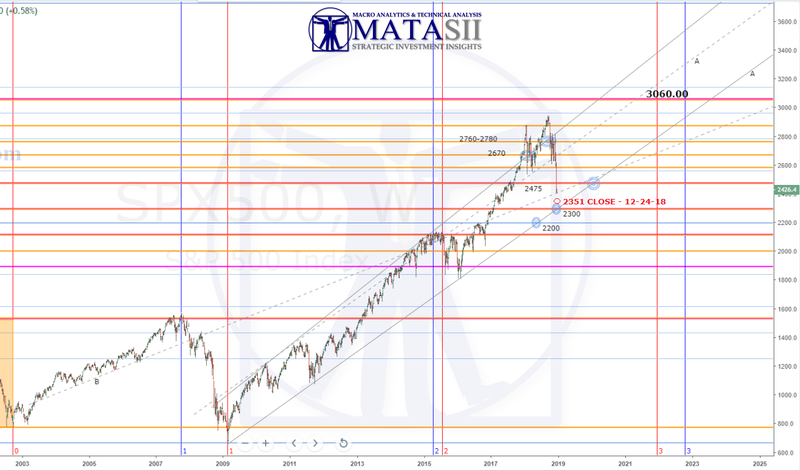 The confluence would suggest that Investors should be highly wary of a violent Bear Market Counter Rally occurring. The longer term Elliott Wave Analysis below) is suggesting that the Right Shoulder may be higher than shown above. 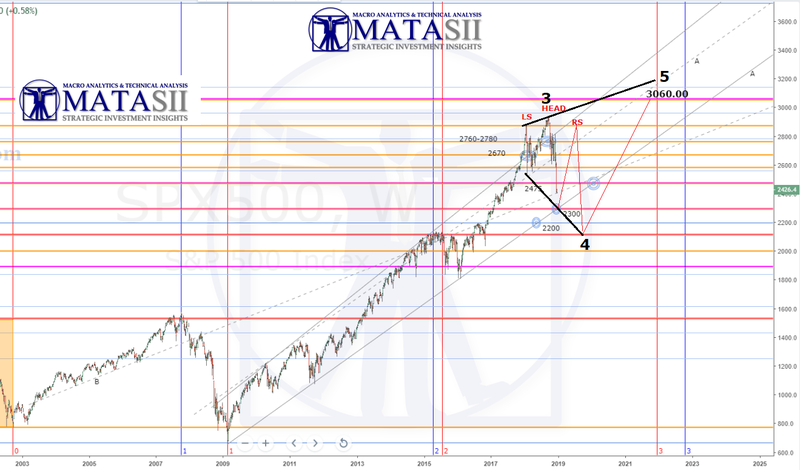 The MATASII Fibonacci's suggest that Wave 5 (rising from the Wave 4 Neckline shown above) will end at 3050 in the 2022 time frame. From here a multi decade Fiat Currency Collapse will likely ensue.